Lothric was sitting down at an outside table of the small Café he had stopped by during his rounds of shopping. This was not usual for him to do and so was the shopping but ever sins he had joined Syne, Lothric had begun to do things like just wandering around town and shopping, not that he didn't like people before or anything it was just that he was always deep within his own training but he had decided to take a break this week and boy was he glad for that. Looking over his attire Lothric gave himself a small acknowledging nod over how he had dressed today. Some simple blue jeans and a open hoddie with a white tank-top underneath, some brown trail boots as well. Not that he thought it was all that but Lothric didn't really care to over dress for the situation he was in. Tho one thing that was normal was the sword Lothric had with him which at the moment was leaning on the table as he took another sip from the green tea he had ordered. It was a nice day outside, a tad bit warmer then normal which reminded him that he should buy some swim wear for the summer and be done with it before doing anything else after he was done with the Café. Looking around his surroundings Lothric tried to scan the crowds for any individuals of note that he might enjoy a conversation with but alas he couldn't seem to spot any one in particular that made him focus upon them. Still he could have tried harder to find some one but Lothric was enjoying himself and couldn't help being swept up in the calm peace that the solitude left him with but he still didn't enjoy the solitude it self and was hoping some one might just take the chance to sit by him so that he could have an interesting conversation. People were staring. Some because they knew the person they saw others simply because of said person's strange actions. Dancing down the street in his normal outfit of a skirt with long stripped leggings and his cammo jacket Malachite had his headphones on and not a care in the world. With his bag strapped tight on to his back he kept dancing down the sidewalk. He wasn't out for any specific reason but he just didn't feel like staying cramped up in the school today. It was a pretty nice day out so he didn't really need the jacket he was wearing but it was still an old habit of his to just throw it on wherever he went. After all when you travel a lot the chances of having to fight off grimm go up quite a bit. Passing by a small café he realized how thirsty dancing made him. With a shrug he diverted towards the establishment. As he reached the counter, still dancing he dropped his headphones down to his neck and the rhythm in his feet stopped. A few people clapped while others noticed who he was and whipped out their cell phones to take a picture. “I'll take a Triple, half sweet, non-fat, caramel macchiato, with six pumps of raspberry and six pumps of vanilla,” Mal said, to the audible groan of one of the baristas. Paying for his drink and moving to wait for it to be done he whipped out his scroll and was about to start killing time on it when he noticed someone else at the café, sitting outside was a guy with sword. It was a bright and beautiful day of which it would have been a crime against nature to not enjoy by spending it outside. 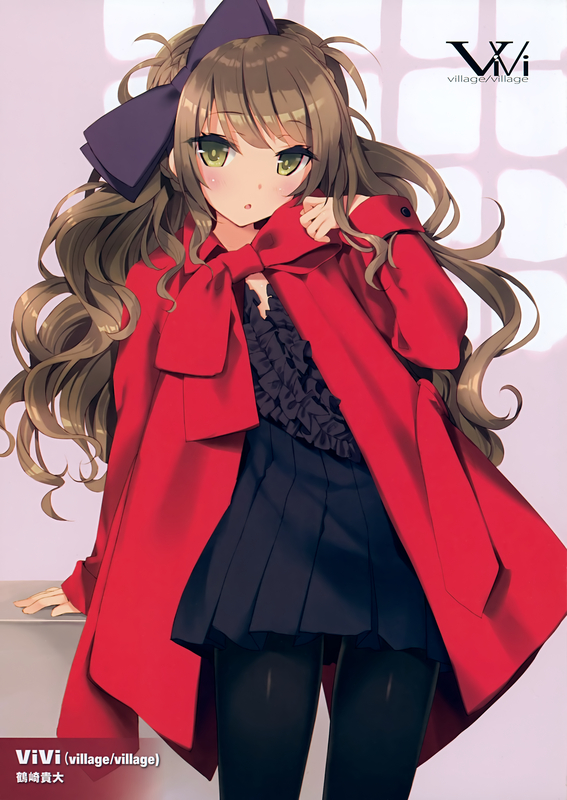 The fresh air of the late winter was still lingering and even if she could warm herself up with her heater, Melany decided to wear her red coat that she had forgotten in her closet for her wandering that she had "planned" for today. Her first stop though had to be the coffee shop, after everything that had happened, she could finally enjoy herself a good coffee made from beans coming directly from Menagerie. She smiled to the manager who was the one handing over personally her warm cup as he returned the smile. "I can't thank you enough Miss, this one's on the house. To hell with it, come and get a free coffee everyday. Without you the shop would have been closed, you deserve it! The same goes for that other android, if you ever see it again please say thanks and hi from me, would you?" "Of course Sir, I'll be sure to tell Flash." She smiled to the manager before turning on her heels, nearly bumping into a girl wearing green who seemed to have gotten the attention of others in the shop. "Sorry, I wasn't paying attention around me..."
After making sure neither of the two had spilled their drink, the android began to slowly walk towards the exit, taking a moment as she went through the door to feel the rays of the sun warming her while the slight breeze cooled her back. The day was so far going well and things only seemed they would get more interesting when Melany noticed a young man siting at a table outside who had quite the fancy sword leaned against the side of the table. It was such a fine blade, a real piece of art, she couldn't resist but get closer and instinctively spoke first to the man. "It is quite the weapon you have there, I bet you're a hunter, if not you buy me a drink." Mel giggled slightly as her eyes switched between the sword and the man, hopefully not disturbing him from his tea. Lothric finished his tea before letting out a small sigh, he had enjoyed it more then he thought and was debating if he should get another one. Suddenly his attention was drawn to a rather gorgeous female that praised his weapon and that seemed to believe him to be a hunter but then came the strange bit that if she was wrong he would have to buy her a drink, this confused Lothric a little but he simply filed the thought away for later and simply bowed his head towards the woman. Raising his head Lothric spoke in his calm and regal manner "I thank thee for they compliments upon mine chosen weapon. I am a student at Syne so I will leave the answer to your question for thee to gather." giving her a smile Lothric began to speak with his usual tone once more, "Pray pardon my lack of manners. I am Ser Lothric Ember, if thee doth nay have an issue with me asking then pray tell who are you?" It would be a lie if Lothric were to say he hadn't looked over her features even if it was just a glance as he had bowed his head but she was beautiful and Lothric couldn't deny that but he had to hold his composure or he might simply be branded a pervert which he hoped to avoid at any cost for the moment. Still in any case he was happy for the chance to talk even tho his face had the neutral stance he kept for most of the time, his lips was still slightly formed into a smile if even to be polite towards the one that had pulled him from his own solitude and for that alone Lothric would at least grant her the enjoyment of a conversation if he could. After ordering his drink Mal waited near where they would hand him said beverage while taking a few glances at the guy with the sword. He was obviously strong if he could wield that thing. But strength didn't indicate any level of skill. Though it did beg the question of if this guy was a student at Syne or not. It was possible, the place was large enough to not have met everyone yet, and with the posse that tended to follow Mal around it did keep him from just accidentally running into people. It wasn't too long before Mal's name was called and he received his drink, of course it was a bit longer than people who ordered simpler drinks, but that was the price he had to pay for deliciousness. Just as he grabbed his drink and was about to turn around to find a seat Mal narly bumped, or more like he was almost bumped into, by a woman in a very red jacket. “No no, you're good,” Malachite said, he was just glad his drink hadn't gotten spilled, that would have been a real tragedy. With a small shrug Mal put his headphones back up onto his head and the music started. Though his eyes did follow the lady who had almost smacked into him as she approached the guy with the large sword. It definitely was a conversation starter that's for sure. Scanning for an empty seat Mal found a small table with two chairs that no one was at and quickly settled down. Pulling his laptop out of his bag and setting it on the table he synced it with Beat6 and his headphones. Maybe he could get a little work in. Melany was slightly taken aback by how courteous the man was. By the way he was dressed, there was no way for her to guess he would introduce himself with such elegance. She looked at him for a full second, frozen with nothing to say before giggling lightly. "Oh please, no need for such noble manner with me, I'm in no way deserving of such a treatment. But if you must know, the name's Melany and it is a pleasure Ser." The girl then sighed softly and looked away with a light smile, feigning sadness in her eyes. "If you're a student at Syne, then you are a hunter even if it's in training. Sometimes I wish I was wrong~" She then giggled before smiling to Lothric and gesturing to the chair next to her, asking if she could join him. "It really is a pretty blade. I'm in no way swordsmith, but I love art and this is truly deserving of of being seen as such. The details of the blade are just magnificent. Truly a beauty, I hope you take care of it, it may be a weapon but it needs all the love and maintenance you can give. It'd be a shame to see such a piece rust away." Mel Was fixing the sword with attention, as if she was staring at a painting in a museum, her eyes scanning -both literally and figuratively- the beautiful weapon that was in front of her. She was certainly an art lover for sure. "All are deserving of my best manners until they prove towards me otherwise Miss Melany." his tone was the same yet it was spoken as a matter of fact for him, Lothric let out a small chuckled when Melany stated he wished to be wrong at times. Placing the cup of tea back onto the small plate Lothric moved his hand towards one of the free seats as to answer her to sit down. "Who said you have to be wrong to earn a free beverage, I would be more then happy to gift you one should you decide that to quench thine thirst need more then one." turning his gaze back towards his blade Lothric chuckled lightly. "Indeed, Sanctus Ignis is a work of art. The finest sword made from the Ember Forgeworks I must say, tho I did take pride in handcrafting it. Alas the recent maintenance and re-forging was done by the master craftsmen as I nay posses the materials nor the forge that is up to the task here." he felt pride in talking about the craftsmanship behind the blade and couldn't help but feel that the old forge master would be happy about the praise, Lothric missed the old fellow but history is history and he doubted his family would be welcoming if he were ever to visit but that was a bother for another time. Lothric grabbed a lighter from his pocket and ignited the gas with the flint before taking control of the small flame, making it grow in size he split the fireball into three smaller orbs which proceeded to float around his being as they changed shape into small fiery butterflies. "So mind if I ask what you are doing here of all places on such a lovely day?" his tone was friendlier then what it was normally but he didn't want to be rude still striking up a conversation with Melany sounded like the best way to pass time around here and who knew he might even have some company for the remainder of the trip. Melany giggled to Lothric's comment giving his best manners as well when he said to be ready to buy her another coffee if the one she had wasn't enough. "You really don't have to, but it is a fun thing to receive, just don't overdo it alright? Would be a shame to exhaust all your tricks on day one, no?~" Siting down at his table, they both watched the impressive weapon, Mel listening carefully to his little story while she was analyzing the metals contained in the blade. At first she wondered why magnesium was part of the compound, but then the moment Lothric did his little trick with the flame butterflies it was obvious. She smiled at the sight of the flame insects, watching them fly around. "Handcrafted things are always the best. They capture their creator's essence, feelings, dreams... giving them life like nothing else could ever do." Mel's eyes then focused back on the man in front of her as he asked what she was doing here. She smiled and looked at her cup of coffee before taking a sip from it, letting go of a satisfied sigh. "I didn't have anything planned today, so I figured I'd roam in town, maybe do some shopping like you." She looked over at his bags for a second before looking back at him. "At the same time I just feel like walking around and appreciate this beautiful day. And a day like this has to start with a good cup of coffee, or tea, all depends on personal tastes." The girl smiled before taking another sip of her hot drink. "How about you? Beside shopping you surely had something else to do today, no?" "Please, I highly doubt that I could spend all of mine tricks today. I must agree that items crafted by the loving hands of a craftsman do hold a special quality that no simple production line can replicate." Lothric's tone was a bit more gentle this time, he couldn't help but chuckle as she stated her reasons for being here today and while Lothric didn't mind it at all he still found it a relief that she choose to answer. "Normally I would be hunting the creatures of the darkened abyss or once more settle into my training regime. Yet this fine day I had the urge to finish my shopping for essential items and deal with the procurement of swim wear so that I nay have to do it during summer." his normal calm and neutral tone was back as he spoke. Looking over to the table where a person in a green hoodie sat alone with a laptop Lothric couldn't help but wonder if this one was also lost in solitude as he had been, not wishing it upon any one he let out a small sigh as he slowly stood up. "Doth thee mind watching over mine belonging while I get a refill, and by chance havet thee any wishes for a beverage while I am gone?" the words were said with his normal tone but in a friendlier way then normal. Malachite was lost in his own world. With his headphones on the sounds of the world around him were distant and washed out. With the music making program, Looty Fruits, open on his screen he kept testing what worked with the general melody that he had set up. Of course the funny part was that his music studies back in Mistral had never helped him one bit when working on his songs. Instead he usually made his songs through experimentation. After several hours or sometimes days working on a base melody he would then set it up and start working to see what flowed with it. Of course over the years the process became easier for him as he was able to start to visualize in his head what the music would end up like. But it wasn't until the sounds hit his ears that he would know what was working and what wasn't. But so far this new track was coming along better than he had expected. Getting into the flow of working usually made him far more productive than otherwise. Unfortunately with all the school work he had his normal schedule of releasing music had to slow down. But in return he was trying some new things and expanding his skill set, he just hoped the fans would approve of it. Rather than typing most of Mal's actions were done with the track pad of his laptop, after so many years of using it to make music he was incredibly good at only using the computer and not extra peripherals for his tracks. Of course he did have a better set up in his dorm room but that was for more major things, right now he was more working on a few tweaks and changes with samples he had made earlier. Though the best part had to be that it freed up his second hand to drink his incredibly complex beverage. Melany couldn't help but have a little smile on her face as Lothric said that he wouldn't use all his tricks today. Was that supposed to mean they'd see each other again? Maybe, maybe not, who could tell. She then listened to him agreeing with her on the fact that handmade items were better. It was nice to speak with a craftsman who was obviously loving his work, although she wondered if he could do more than fine blades. She was about to ask him just that but he continued by answering what he would usually do in his days and stating that he was looking for a swimsuit for the upcoming summertime. It made Mel think that she would probably need a swimsuit herself, but before her thoughts went further ahead Lothric stood up and prepared to get himself another drink it seemed. He offered to get her something too. "No thanks, I'll be fine with this one." She gave him a smile before losing herself in some thoughts. He seemed like a nice guy and his craftsmanship was something really interesting about him. The android girl would wait for his return to ask him if her made other things than swords. Thinking about swords she picked up Lothric's and placed it in front of her to admire it from a better angle. It was really a pretty piece of work and Mel knew that a lot of time and love went into crafting it. She was so in awe that she probably stared at it until the owner of the weapon would comeback. Walking inside the café Lothric moved up towards the barrista and order a refill on his tea, while he was waiting for his order to be complete he looked around and started to wonder about inviting the female outside who was on the laptop to join him and Melany in their conversation. When Lothric was handed his order he walked out and stopped behind Malachite and lightly tap her shoulder while giving her a smile. Hoping she could hear him he spoke with a calm and gentle tone "Good day, sorry to bother you. I was wondering if you would be interested in joining me for a drink?". Lothric was wondering what she was doing on the laptop but he wasn't going to bother her with more questions then what he already had. Lothric had turned his gaze towards Melany as he waited for an answer from Malachite and had noticed she seemed interested in his blade, he was wondering if he should perhaps show her his skill in making jewlery. Malachite was working pretty furiously. He didn't know why but he was just in the grove right now. He wanted to get this song done before too long her as he had promised it out by the end of the month. Like any artist he had his own website that he put his music on, and his most recent update had told that he was going to be releasing a new EP soon. Had he not been so into his work he might have noticed the man walking up behind him from the slight reflection on screen. Instead as soon as he was tapped on the shoulder he jumped and tried to spin in his seat. This caused two things to happen. The first was his headphones falling off his head and ending up on the ground, the second was his drink slipping from his hand and ending up spilling over his jacket. With a wide eyed stare he looked at the person who had startled him and then down to his jacket, now covered in what was left of his drink. In a small panic he unzipped the jacket and removed it before any of the drink could spill onto his skirt. Underneath his camo jacket he wore a simple black form fitting t-shirt. Of course to anyone looking the blatant bumps on his chest would cement the idea that he was female. With her eyes still locked unto Lothric's sword, there was no way for Melany to notice that the man she was talking with moments ago was now talking to someone else, which was a good think that he missed this or else the girl would had no second thoughts as to label Lothric as a shameless flirt. It would have made sense though, a man, all alone, who speaks in such a rare way and creates beautiful things with the use of his powers. Lucky for him though, Mel saw nothing. Staring at the weapon, the girl slowly finished her own drink, lost in her thoughts as to how Lothric was able to find so much magnesium to form the center piece of his blade. While magnesium was indeed one of the most common element in the world, it wasn't the easiest to find in huge chunks ready for use in forges, or at least it wasn't on Bellmuse from what she knew. Maybe the metal was imported from somewhere, or maybe he was lucky to find enough, who knows. It was nonetheless intriguing enough for Mel to think about. A small commotion in the shop was what made the android come back from reality. Turning on her seat to see the scene that happened while she wasn't looking. It seemed that Lothric was able to attract attention by bumping into someone which caused the green haired girl to spill her drink all over her jacket. Not feeling like she was needed in that situation, Mel stayed on her seat and watched from afar, laughing at the mess Lothric caused. Lothric's eyes widens slightly as he noticed the headphones hit the ground the the girls drink spill out on her jacket. The surprise this reaction to him simply attempting to get her attention put him in a slight bothered spot as he did not want to get yelled at in public and especially when he was dressed the way he was. Letting out a small sigh he spoke with a calm and apologetic tone "A thousand apologies Miss, it was not my intention to cause you such trouble." Noticing that she had taken off the jacket and saw the form fitting shirt Lothric immediately removed his hoddie and offered it to her as he once more spoke "Here it is not proper to leave you without at least something to cover thy self with at least." Lothric was now avoiding looking at anything below her eyes as he did not want to bother her any more then he already had, besides he would like to avoid being called the word pervert for any price at this moment. Still this had turned into quite the bother but all he could do was wait and hope she would not chew him out to harshly, tho he was expecting her to as well as doing something of a similar nature to his own clothing which he would likely just allow her to as he was uncomfortable in his current situation. Still he had to at least offer to pay for a new beverage and bring it to her so that he could make sure she got to enjoy that which she had paid for, with that thought on his mind Lothric spoke once more with the same calm tone "I am very sorry to speak again as I am sure you have much more important words to speak but please allow me to pay and bring you another beverage of your choosing." “Well this thing's going to need to see the wash sooner rather than later,” Malachite said while taking some napkins from the table and doing his best to wipe off the camouflage jacket. If nothing else he didn't want it to drip onto anything else, besides that he could just turn it inside out and carry it until he could wash it back at the dorms. “Huh? Don't worry about it, it'll come out in the wash no problem,” he said while giving the man who had startled him a small wave of his hand. Unlike most people Mal wouldn't get upset over something so simple as a spilled drink. Suddenly finding himself being offered this guy's jacket Mal raised an eyebrow and looked down at himself. It wasn't like he was really showing anything off, the neck on his shirt wasn't super low either so why would this guy be offering his jacket to cover up? “It's alright, It's not like I'm just running around in my underwear or anything, and besides I doubt your jacket would fit me,” he said. Considering the guy was more than a foot taller than Mal the jacket would probably just slip off. Luckilly most of the drink had spilled onto Mal's jacket so there wasn't a lot of extra cleaning to do, nor did any get on his laptop which was good. Sure he could replace it easy enough with the money he had but the thing still ran like a champ and was a proverbial tank when it came to physical abuse. Mal raised an eyebrow at the white haired guy who had started him, did that guy just apologize for talking? “No no, it's alright. But I mean if you insist on buying me another drink I can't say no to that,” He said with a shrug. Sure he had more than enough to pay for plenty more drinks but if this guy was going to insist that he buy a new one then Mal wasn't going to complain.